I really like Apple products. I don’t have a Steve Jobs tattoo on the small of my back like Preston but I prefer their products to the competition. In my household we have two iPhones, a Macbook Pro, a 27” iMac, an iPod touch, two iPad Classics and we’re planning on buying a MacBook Air this summer. Yeah, I like their stuff. Despite all of my fanboyism there are some aspects of Apple that I just don’t agree with – like the Course Manager for iTunes U.
I’ve been playing around with their iTunesU Course Manager which lets you aggregate, organize and deliver your course in a modular sort of fashion through iTunes. It really is a pretty slick ad easy to use web based app. You can add all sorts of information from discussion questions, assignments, just about any type of files (video, audio, PDF, Word documents, links etc.) and the Course Manager is web based which means it works on any computer with an Internet connection regardless if it’s an Apple product or not. You only need an Apple ID (which is free). A friend of mine summed it up pretty well by saying “Apple wants everyone in the world to have an iPad,” which of course they don’t. Why not let people view it on their computers inside of an iTunes U app? We can create it from any type of computer as long as you have Internet access. Apple doesn’t do this and probably won’t anytime soon. So what are the options? The school buys iPads for everyone one of its students and teacher. A lot of the content won’t display properly on an iPod touch/iPhone so iPad is your only option. If the school purchases it and provides it for each student than iTunes U goes from being a novelty to a very powerful medium to deliver rich and meaningful content to students nearly instantly. Awesome but costly. Especially when you start considering cases, keyboards and extra iPads for those that are destroyed, lost, stolen or simply forgotten at home from time to time. This coupled with a powerful LMS like Edmodo, Schoology or Moodle can render textbooks as a mere starting point for research, instead of the only destination for research (as many students and teachers tend to do). Have a true BYOD program where students have the option of bringing in iPads or laptops. This means that some of the students can get at the content on iTunes U and others cannot. The results here are very predictable. Teachers don’t want to fragment the way to get information to the students so most probably won’t use iTunes U at all or rarely, because whatever they do on iTunes U they will have to do someplace else as well. Double the work. Not very ideal and teachers simply won’t do it. 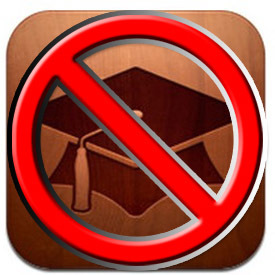 Take a pass on iTunes U for the time and wait until it can be consumed on other devices (if that time ever comes). This entry was posted in Opinion, Patrick Cauley and tagged Course manager, iPad, iTunesU. Bookmark the permalink.